This specimen probably represents the pubic symphysis with its fibrocartilagenous joint. Note the approximate symmetry around the midline (  ). 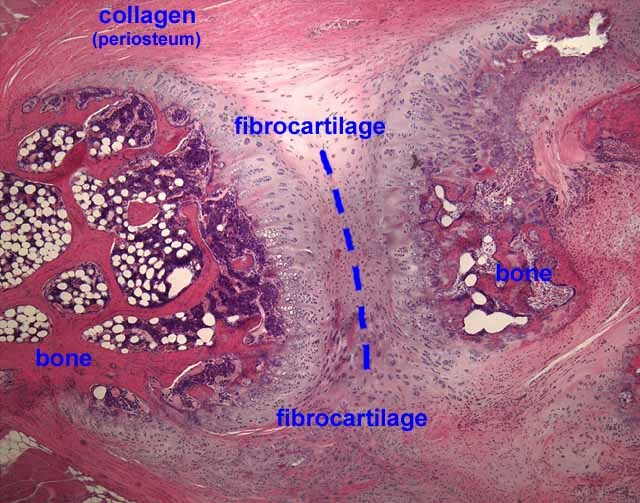 On this image, the deepest red color is bone, the dark purple is bone marrow (white spots are fat cells in the marrow), gray is cartilage and pink is collagen of the periosteum / perichondrium. Active endochondral ossification is occurring at the boundary between bone and cartilage. Choose the thumbnail at right for an overview, or one of the thumbnails below for detail.